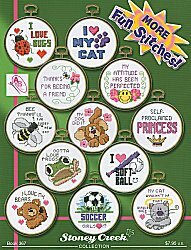 Navigate: StoreFront / Stoney Creek Cross Stitch Charts & Patterns / Stoney Creek Books / Book 367 More Fun Stitches! Book 367 More Fun Stitches! All designs are shown stitched on 14 ct Aida and displayed in a 3 1/4" gold round frame.